There's another baby on the way, a new house to renovate and his club are still kicking ball in the muck and bullets of the usually fallow days of January. So he's slightly busy you could say. 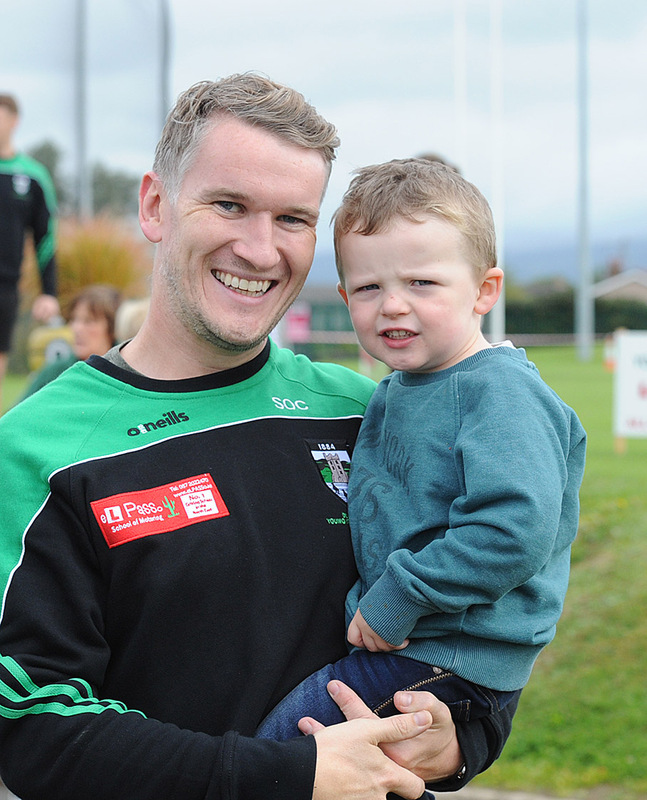 But, despite what you may think, Shane O'Connell is savouring every moment of Young Ireland's All Ireland club championship roller-coaster ride. He knows as good as the next man just how quickly it can all change. While the 2018/19 season has been an unforgettably joyous experience on the pitch for Dundalk Young Irelands, and its loyal band of followers, O'Connell has made sure he has taken the time to occasionally stop and breathe it all in. Savour it and bottle it up for later. Enjoy it now as much as you can, he says with an ever present smile on his face. And not just because he's nearing the end of his footballing career - the light dusting of grey hair around his temples attests to that passage time. There have been sadder moments in the past 12 months too, O'Connell explains, as he sits down with The Democrat. “We lost a club and Louth GAA legend in Mickey McCabe and also a good friend of mine in Diarmuid McArtain (St Patrick's GFC clubman who died in November). “The loss of those people as well as Conor Morgan (Dundalk Gaels man who passed away suddenly while on holidays in Greece during the summer) really puts it all into perspective. “Any day you can run around after a white ball is a good one,” he adds sagely. For how much longer he’d be kicking that white ball had been something O'Connell gave a lot of thought to a while back. But he's clearer in his mind now. The greater sense of focus and mission at the club this year has also helped. “This coming year will be a busy one for me personally, but I believe we have the players, management and overall club structure to push onto more great things next year and that would be a shame to miss out on. I'm really enjoying it and once that's the case I'll never be too far away,” he adds. That doesn't necessarily mean the body has signed up for going that bit longer mind. Once Young Irelands had secured the county championship in early Autumn, the training ramped up. O'Connell took a bad knock one evening. “It was in one of our first training sessions back, I got a bit of a rush of blood to the head and went in to tackle big Sean McLoughlin and lets just say I came off second best! “I fractured my wrist that night and I was put into a cast for six weeks. It was one of those moments you instantly regret, but Adrian (O'Donoghue, manager) promised me the season would last longer than the injury and he was right. But back a bit, to a less busy time. O'Connell has devoted himself to the club from an early age. You get the feeling he didn't have a choice. “I remember when my brother Peter played and I used to go and watch him. I could never wait to be playing at the age group ahead of me, no matter what age group I was under. There have been some true club stalwarts off the pitch that O'Connell tips his cap to as he looks back over the years. You know the type of folk, every club has them, and every club would be nothing without them. “The likes of Pat Bailey and Tony Hande, and many more that took the time to train and manage us when we might not always have been the best team and also lacked large numbers of players. The club has been reinvigorated by this season's success. You can feel it around the town. You can see it in the black and green bunting still adorning lampposts. It's a success the club was not prepared for. A success which doesn't come lightly, especially financially. It has required many to dig deep into their pockets to fund the journey. O'Connell can only applaud those generous souls. Generous both in money and time. “The thirty three or four players that make up the squad and management team are the face of the club, but behind the scenes there is amazing work going on in this club. One more win and little old Young Irelands from Dundalk are into an All Ireland final. Breathe it in and remember to bottle it up. Buses available on the day of the semi final in O'Moore Park, Portlaoise on Sunday January 20th.